Lots of Friends came to my car track racing day. Everyone was very amazed at the how big the track was. Each person brought some Hotwheels or Matchbox cars and each person chose five of their cars to race. We put eight of the cars down the track at a time. (since the track could only fit eight. )The one or two cars that lost were knocked out each race. So slowly, the rounds went on and the cars were knocked out until there were only eight, then seven, all the way down to two. The end race was between Lawson's Formula 1 car and Micah's Silver car. These raced and the winner was Micah's Silver Car. We also used this track at Cadets, which is the boy's club I go to, and we did the same thing. Two of Luke's cars, two of my cars, two of Joel's cars and Corey's bus and car, James' car and other people also had cars in the top twelve. Everyone else's cars were knocked out before then. We slowly raced these cars and kicked out the Bus saying it was too long. The rest raced and Joel's were knocked out in 5th and 7th place and James' was in between. I lost one, Corey lost one, so it was two on one in which Luke's was knocked out and so it was down to me and Luke. We played off three times in which Luke won twice and I won once, so he became the next Car Track Champ. Cool page! It sounds like you had a great time! and yes I'm going to make another page. this track looks amazing. It is huge! Can you tell us more about how it was constructed? Ben, this is truly inspiring. I hope lots of home schoolers get to run exciting events like this! 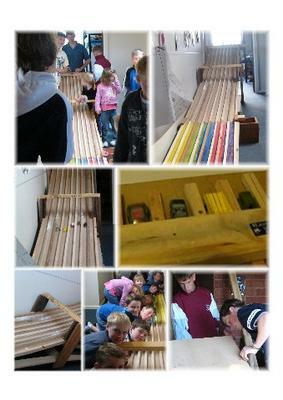 It takes ingenuity to build the track and lots of good ideas to run it properly. It is also inclusive which is great. Well done!